Practice time is limited. The serious guitar player is always interested in learning if there is any way to get an extra edge. Especially if it doesn’t require investing more of the already-scarce resource known as “free time”. The good news is that there are many ways to practice in your not-so-free time. In this article we’ll deal with just one method, which is to use special tools to condition your hands and fingers to play the guitar. The appeal of these tools comes from the fact that they can be used just about anywhere. A long car ride, or even waiting in line, might become an opportunity to do some extra guitar conditioning. The Captains of Crush Hand Trainer[? 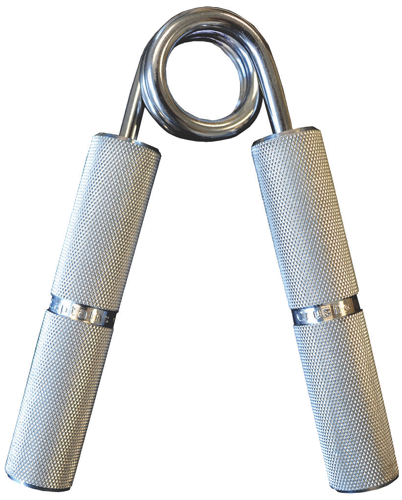 ]Affiliate Link is a professional tool used by body builders to progressively increase grip strength. It comes in many different tension ratings, from 60 lb to a whopping 365 lb. Imagine what it would be like to exert over 300 lbs of force with your bare hand! The manufacturer recommends using this in a dedicated manner, and specifically cautions against using it while watching TV or driving. If you work out, why not throw one in your gym bag and do a few grip squeezes during sets? Tools such as the Gripmaster Hand Trainer[? ]Affiliate Link are gaining in popularity, often making an appearance in music stores. This makes a great “fidget” tool, but be sure to buy a wide range of them. It’s best to start with the easiest one, and work your way up. Fidget with it several times per day until each finger has done about 20 or so repetitions. As this becomes easier, switch to a higher tension and repeat. The use of these tools is not without controversy. Some fear that they may build the wrong muscle groups. If you are currently experiencing pain or injury, it’s not recommended you start using these tools without consulting an expert first. In addition, although these tools might improve strength, they don’t necessarily improve speed. In fitness, strength and speed are two different training goals which are addressed in different ways. Training with these tools might be a very realistic way to increase your strength, speed and endurance for playing the guitar. Give it a try!